By Jim Dower: The World Boxing Association has made WBA Super World cruiserweight champion Denis Lebedev ‘champion in recess; which now makes Yunier Dorticos (22-0, 21 KOs) the full WBA cruiserweight champion for his fight with IBF World cruiserweight champion Murat ‘Iron’ Gassiev (25-0, 18 KOs) for their unification fight this Saturday. 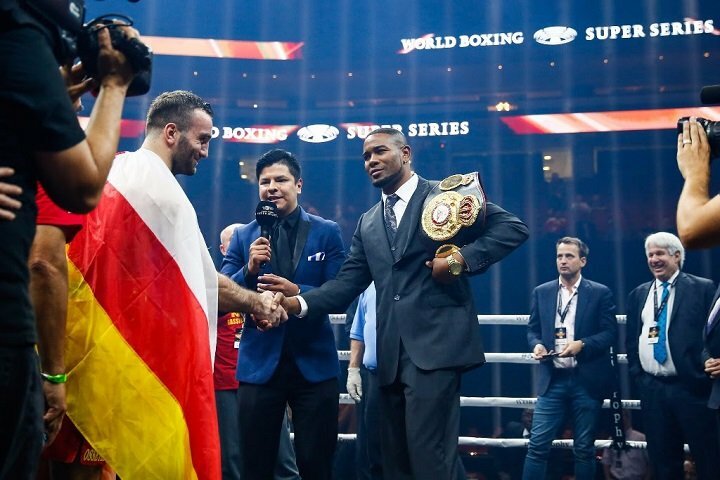 This is good news for the World Boxing Super Series cruiserweight tournament, because it makes the Gassiev vs. Dorticos fight a unification fight due to the full WBA title being on the line. The WBA will have their title at stake in the WBSS tournament. When the dust settles Oleksandr Usyk could have 4 of the cruiserweight titles in his possession on May 11th when the WBSS finals take place in Jeddah, Saudi Arabia. The WBA made a good move in making Dorticos their full champion with their organization at cruiserweight. However, with the WBA’s decision to change the 38-year-old Lebedev’s status to ‘champion in recess,’ it leaves the question of whether the ultimate winner of the World Boxing Super Series tournament will have to face him rather than moving on to other fights. Lebedev is certainly a good opponent for the winner of the WBSS to fight. Usyk and Gassiev have both said that they’ll be looking to move up to heavyweight if they win the WBSS tournament. If that happens, then Lebedev might be stuck fighting for the vacant WBA against the highest rated contender. That could be Dorticos or Gassiev defending on whether one of them stays at cruiserweight. Gassiev beat Lebedev (30-2, 22 KOs) by a 12 round split decision on December 3 in Moscow, Russia. But for some reason, Lebedev was allowed by the WBA at the time not to have his title on the line for the Gassiev fight. Instead, Lebedev only put up one of his titles with his IBF cruiserweight belt at stake. So, when Lebedev lost the fight to Gassiev, he was still able to keep his WBA belt. When you look at how the WBA yanked super bantamweight champion Guillermo Rigondeaux’s title away from him after he moved up to super featherweight to challenge WBO champion Vasyl Lomachenko last December, it looked strange that the WBA didn’t take away Lebedev’s title after his loss to Gassiev in 2016. Common sense would tell you that Lebedev should have lost both of his cruiserweight titles – IBF and WBA – when he was defeated by Gassiev. Lebedev has fought only once since his loss to Gassiev in beating Mark Flanagan by a 12 round unanimous decision in a voluntary defense of his WBA Super World cruiserweight title on July 9 last year. With Lebedev having no fights scheduled at this time, it’s unclear when he plans on fighting again.